If you cant find what you are looking for in our range of pre-designed PVC banners, just let us know what you need and we can design it to suit your needs. Do you have a unique event coming up and need a PVC banner to help advertise, we can design an eye catching PVC banner for you! Valentine’s Day takes place on 14 February and it’s become increasingly popular from a commercial perspective. In addition to Valentine’s Day cards, people also buy flowers, chocolates and champagne to celebrate the occasion. It’s also common for Valentine’s Day couples to enjoy a romantic meal, with businesses and retailers pinpointing 14 February as the first date in the New Year where customers are prepared to spend money after an expensive Christmas. 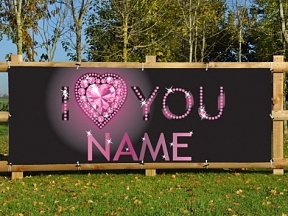 At HFE, we have a wide range of Valentine’s Day Banners available so that you can promote your business accordingly. 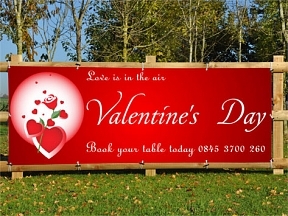 The banners will remind customers that Valentine’s Day takes place on 14 February and can also be used to advertise what you have available as a business. 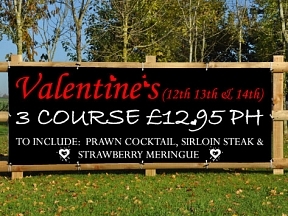 Many pubs and restaurants use Valentine’s Day banners to advertise their special menu for this particular day. You might simply want to alert customers that bookings are now being taken, while some outlets flag up prices for a three-course menu. Hotels also pinpoint Valentine’s Day as part of their marketing spend, with couples looking to enjoy a romantic meal and overnight stay on 14 February. Many hotels have leisure facilities such as a swimming pool, spa, jacuzzi and sauna which means a Valentine’s package can be created accordingly. Florists have also seen out January and are looking to get the tills ringing for Valentine’s Day, with customers regularly wanting to say it with flowers. Our banners are perfect for carrying images of their bouquets, especially with the free design service that is available. 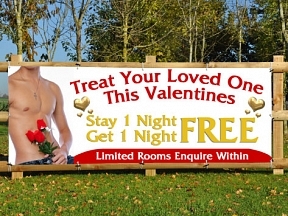 It’s worth noting that Valentine’s Day banners serve a longer-term purpose. If you put your business on the map on 14 February and customers are impressed with the products and service, then you’re likely to enjoy repeat business throughout the spring and summer. Our PVC Valentine’s Banners start from £19.99 and you can naturally choose from one of the range at the website or instead create your own banner. There is always the chance to customise a banner to fit your own message and graphics. 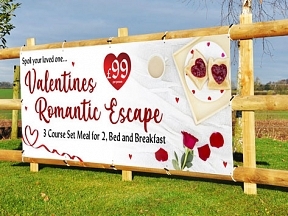 PVC Valentine’s Day Banners are a great way of advertising your business, especially if you get plenty of passing footfall and motorists who can see this marketing message building up to the big day.